Excuses are easy, but when it comes right down to it, it's also easy to make your bed each morning. No, you don’t have to turn out a display worthy of Pinterest or Elle Decor—unless you enjoy that sort of thing, in which case have at it. But a quick fluff of the pillows and tug of the sheets and comforter takes only seconds, and it is the easiest way to make your entire bedroom look better instantly. Beyond that, however, there are some surprising benefits to making your bed each day. These are powerful words, and you don't have to be able to bounce a coin off your military-style-made bed to benefit from them. Even the most organized, beautiful bedroom looks less tidy with an unmade bed, and the converse is also true: When the bed is made, it helps the rest of the room look styled, even if it is not perfect. Better still, once you are in the habit of making your bed, you’ll likely feel inspired to improve your bedroom’s appearance in other ways, even if very small. From tiny beginnings, great things grow. Maybe next, you'll tackle the closet. "Wait a minute," you might be asking, "How is making the bed going to increase my productivity?" A fair question, and you’ll find the answer in the book, “The Power of Habit,” by Charles Duhigg. According to the author, daily bed making becomes a keystone habit, something that kickstarts a chain of other good decisions throughout the day, and gives you a sense of taking charge. Duhigg claims that these keystone habits cumulatively lead to "a greater sense of well-being and stronger skills at sticking with a budget." Pretty impressive results, simply for taking a minute or two to pull up the sheets and comforter. You spend roughly a third of your life in your bedroom, and the appearance of your room has an effect on your mood. It’s hard to feel calm, relaxed, competent and grounded when you are surrounded by disorganization. 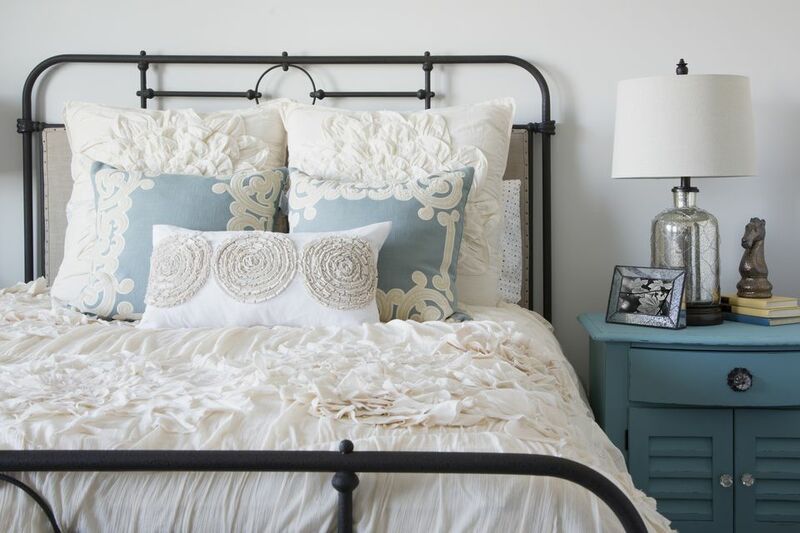 A properly made bed (no, it doesn’t have to be up to military standards, just neat and unrumpled) instantly makes the entire room look pulled together, creating a subtle vibe of tranquility and competence. A made bed shows that you care about yourself and your home, and that feeling of being cared for helps lift your mood and lighten your emotional burdens. Think of walking into a hotel room… the first thing that catches your eye is a neatly made bed that practically begs you to slide between the soft sheets. Now imagine that same hotel room, but with an unmade, rumpled bed. Would you still want to slide between those sheets? Probably not. There’s just something about a made bed that feels better at the end of a long day, partly because it makes the bed look cleaner (even if you actually haven’t changed your sheets in weeks), and partly because when a bed looks good, it also feels good. Few things match the pure pleasure of climbing into a smoothly made bed with a lightly plumped pillow after a hectic day. So take those couple of minutes each morning to make your bed. It just might improve your entire life!